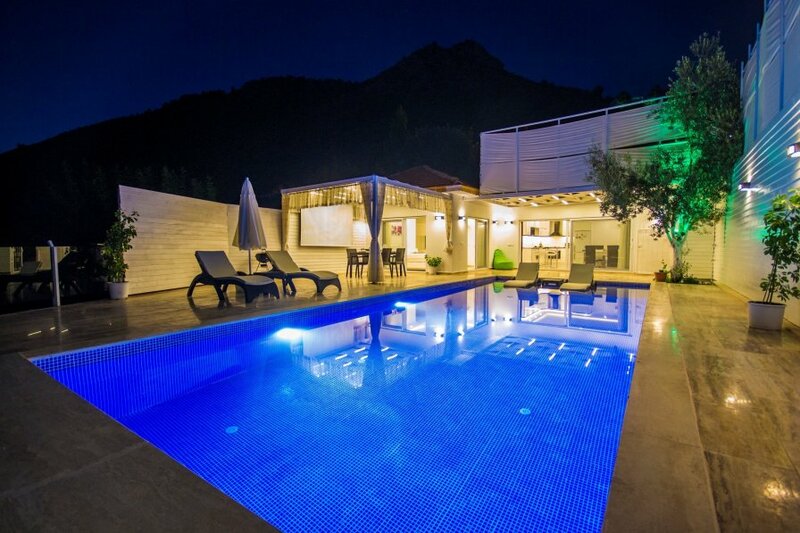 Secluded villa with two bedrooms, one double and one twin, and has a capacity of 4 guests. Both bedrooms have an en-suite bathroom and there is a Jacuzzi in the double bedroom. Located amongst the olive groves in Üzümlü Village, this secluded villa has two bedrooms, one double and one twin, and has a capacity of four guests. Both bedrooms have an en-suite bathroom and there is a luxurious Jacuzzi in the double bedroom. The combined open plan kitchen/dining and living area are fully equipped and tastefully decorated. This comfortable villa has a generous sized pool and patio area which is unseen from outside the villa, making it an ideal property for honeymoon couples and other guests desiring total privacy, be it religious or other reasons. Built in 2016, this villa has been furnished and fitted to high standard, providing guests with an ideal location to 'get away from it all'. The pool is 8 x 4 metres and 1.55 metres deep, plus there is a 3 metre wide shallow end (25cm deep), great for non-swimmers and children. The patio area has an alfresco dining area with an enormous television, sunbeds and hammock, all from which the spectacular sunsets over Patara Beach can be enjoyed to the full. Daily essentials can be purchased from the local grocers shop some one kilometre from the villa, and major shops done in the several supermarkets in Kalkan, eight kilometres away.